In Part 3 of our series on The Lord’s Prayer, we shed more light on why this was a prayer given by Jesus to Jewish people under the first covenant, and not for those of us who are Gentiles. It was meant to be used before the cross, not after. The kingdom has already come in the Person of Jesus Christ; a kingdom must have a king, and they cannot be separated. This wasn’t referring to a future kingdom to come at the end of the world, but Jesus was speaking about something more imminent, meant for those people, at that time. In referring to God’s will being done, this wasn’t pointing towards things that occur in our daily lives, or with world events, it was about redemption that Christ would bring by doing the will of God with a sacrifice to end all sacrifices. 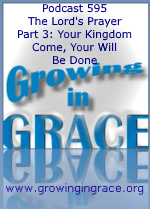 The Kingdom has come, the King is now within you, and God’s will was done through Him. There is no need to request something from God that has already been accomplished. You helped me a lot over the years. Thank you. Thanks for sharing Jeff. We're glad the podcast has helped. Sometimes I sit in church and I listen to the pastor (who is a very nice person and I'm sure a Godly Man), say things that are unsettling in my mind because I know there is more to what he is (not) saying. What are seminaries teaching?? I'm just a common person who loves to read the Bible and I get it. The more I grow in Grace the more I understand the gospel message. Thank you very much for your podcast. Here's how I describe your podcast to others: "it's the message of Grace (Jesus) plus Grace (Jesus), which equals Grace (more of Jesus), which equals knowledge which ultimately equals understanding. Isn't that what we all want? Even the most learned people can get it wrong. Indeed, just because something is taught in a seminary, that doesn't mean that it's correct. I'm sure there are many pastors and teachers who have great hearts, such as the pastor you're talking about, who yet don't see the simple truths that we're talking about here. We hope and pray many of them will come to learn this vital understanding of many of the words of Jesus.